I really like John Goode’s writing, and I LOVE the Foster High books, so I was a equal parts worried and excited to read Mr. Halliwell’s new book. The fact that he was writing the book to finally explain my fave character in the Foster High series was thrilling! I have been waiting for Robbie’s story for over a year now. However, the fact that his story was being written by someone else had me worried. Mr. Goode set a high bar to meet as far as writing this series, and I am happy to say that Mr. Halliwell met that bar with ease! Mr. Halliwell said Robbie’s character was loosely based on him so, to me, it made sense that he would write Robbie’s story. I was not disappointed. I loved this book. It explained Robbie and his actions in such detail. The story had me both crying and laughing, but the seriousness of the story wasn’t lost on me. The loss of Robbie’s one true love was a part of his life he just couldn’t let go. I don’t think I could have been as strong as he was—which is ironic because he acted as though it was a weakness. After staying in a town he hated after the death of his lover for years, he finally moves back home. He is ready to start living again, to move on. I really liked how the author wrote his story. I liked how he told a story within a story. I felt so close to Robbie already from reading about him from the other Foster High books, but this story was what I needed to get that closure that the other books didn’t offer. While trying to overcome his depression and anxiety issues, he meets someone new through his sister. He gets his second chance at love, but this time he doesn’t hide who he is. He works on his problems with the help of Sebastian instead of trying to hide that part of himself. As for Sebastian, he has his own demons to fight. Together they make a great team and a great couple. Snarky yet good-hearted Robbie DeCaro made his first appearance in the pages of Tales from Foster High: End of the Innocence, years after the loss of his first and only love. A New York transplant, Robbie now decides that his work is done in the town of Foster, and the time has come for him to leave Texas. Returning to his childhood home on Long Island, Robbie reunites with his family members. 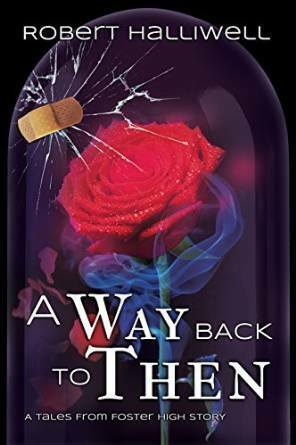 Each using their own unique methods, they try in vain to help Robbie reset to a life he knew before he left it all for the fairy-tale love he found, then tragically lost. Robert Halliwell hails from the mysterious land of Ronkonkoma in the Island of Long and grew up dreaming of the day the dark, handsome Mediterranean Prince of his dreams would whisk him away from the boring life he was accustomed to to a land far, far away...from his mother. A magical place full of roller skates and rainbows called Xanadu. Unfortunately, that never happened, but was instead whisked away to the dark kingdom of Westchester County and the "prince" turned out to be a very pale country bumpkin from Schenectady. Yes, it's a real place. When he's not spending the day writing, Robert can be found at home taking care of his four-legged children, Kira, Carter & Willow and viewing unhealthy amounts of QVC much to the dismay of his husband, Kevin. Robert is still waiting for Lynda Carter to sign the adoption papers he sent her in 1998. Wow, Timmy. This is a beautifully written and insightful review. I've had the Foster High books on my TBR pile since you first talked about them, but with this review they've moved to the top. I always enjoy reading what you think about books and this review upheld the high standard of honest review that I respect you for (among many other reasons.) Great job, Timmy. This book looks awesome. I'm planning on it, Timmy, thanks to you! A Foster High Club would be cool!!! Great review, Timmy! I own most of this series and have been to scared to read them. I really need to read them! Why scared? I will admit there are some super sad parts, but it's so worth the tears. I can't keep up with your reading! So many books are on my TBR because you write these amazing reviews! I haven't put out reviews for a while, so I have a bunch that will be going out.